CNN, Fox News, and MSNBC are the most widely watched cable news networks in the U.S. Their coverage of climate change is an influential source of information for the public and policy makers alike. To gauge how accurately these networks inform their audiences about climate change, UCS analyzed the networks' climate science coverage in 2013 and found that each network treated climate science very differently. The public deserves climate coverage that gets the science right. Media outlets can do more to foster a fact-based conversation about climate change and policies designed to address it, rather than contributing to a broken and inaccurate debate about the established facts of climate science. CNN covered climate science 43 times in 2013. Of these segments, 70 percent were entirely accurate, while 30 percent included misleading portrayals of the science. Most of CNN's misleading coverage stemmed from debates between guests who accepted established climate science and other guests who disputed it. This format suggests that established climate science is still widely debated among scientists, which it is not, and also allows opponents of climate policy to convey inaccurate statements about climate science. The biggest step that CNN could take to increase accuracy is to stop hosting debates about established climate science and instead focus debates on whether and how to respond to climate change through climate policy. Fox News covered climate science 50 times in 2013. Of these segments, 28 percent were entirely accurate, while 72 percent included misleading portrayals of the science. More than half of Fox's misleading coverage (53%) was from one program, The Five, where the hosts often instigated misleading debates about established climate science. In general, Fox hosts and guests were more likely than those of other networks to disparage the study of climate science and criticize scientists. Fox News did show an improvement from a UCS snapshot analysis of Fox News coverage in 2012, in which the network's coverage was entirely accurate in only 7 percent of segments, while 93 percent contained misleading statements. To further improve accuracy, the most productive step Fox News could take would be for hosts and guests to better differentiate between scientific facts about climate change and political opinions about climate policy. MSNBC covered climate science 132 times in 2013. Of these segments, 92 percent were entirely accurate, while 8 percent included misleading portrayals of the science. The handful of misleading statements were inaccurate in the same manner: all overstated the effects of climate change, particularly the link between climate change and specific types of extreme weather, such as tornadoes. MSNBC generally accurately represented nuanced findings around climate change and extreme weather, but they could do so more often to achieve even higher levels of accuracy. Accuracy of climate science coverage by network. View full-size chart with caption. Mutual acceptance of the facts is a prerequisite to having a reasoned debate about how to respond to the risks scientists have uncovered related to climate change. Established climate science should always be portrayed accurately in the media and every cable news network has the opportunity to empower its viewers with accurate scientific information, even as its hosts, guests, and audiences express varying attitudes, beliefs, and values around questions of climate policy. Climate science can be complex and difficult to cover. Yet each of the major cable news networks, regardless of its overall performance, has shown that it can get the science right. Each can — and should — do more to achieve higher levels of accuracy. 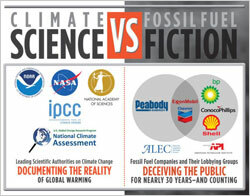 Tell CNN to stop hosting misleading climate science debates! Rights and permissions: You are free to use the graphics above without alterations online, in written materials, and in presentations. Any online use must include proper citation and a link to this web page.